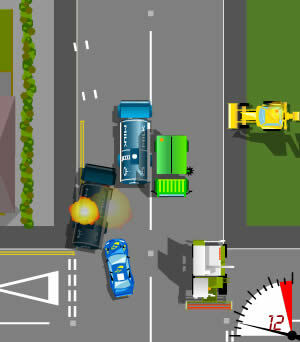 Road Rage game, a rebrandable viral Flash driving game by Galaxy Graphics. Ever been stuck behind a tractor, caravan, milk tanker or something else? Now is your change to gain revenge - in this game, you can blast them off the road. The controls are Left, Right, Up, Down and Space to fire. Like other games by Galaxy Graphics, the Road Rage game is available for licensing. If you are interested in licensing this driving game for your own site and with your own logo and branding, you can help increase your site's traffic dramatically by the power of viral email. Please contact us for more information on flash games. Remember, any aspect of Road Rage's graphics or gameplay can be customised to your wishes. Use the power of viral emails and word-of-mouth to gain more traffic for your site. People pass these games on and on and on..